The Association of Lactation Consultants in Ireland (ALCI) is joined the International Lactation Consultant Association in celebrating IBCLC Day on March 6th, 2013. This year’s theme “Connect with IBCLCs, the Experts in Breastfeeding Care,” highlights the expertise of International Board Certified Lactation Consultants® in providing breastfeeding care. As part of ALCI’s IBCLC Day celebrations, Siobhan Hourigan (HSE National Breastfeeding Co-ordinator) was presented with a certificate from ALCI, of appreciation for her support and inclusion of IBCLCs. 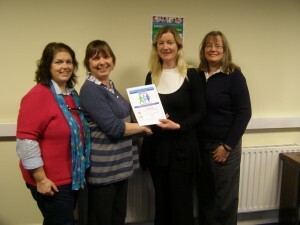 The certificate was presented at the National Breastfeeding Strategy Implementation Committee meeting. Also in the photo below (from left to right) are Nuala Molumby IBCLC, Meabh Anne McNamara IBCLC and Dr. Genevieve Becker IBCLC, all ALCI members on the National Committee. International Board Certified Lactation Consultants® (IBCLCs) are healthcare professionals with expertise related to breastfeeding. In order to become certified, all IBCLCs have extensive training through coursework and clinical practice hours, and they have passed an internationally recognised exam. Because of their training and required continuing education, IBCLCs are knowledgeable about evidence-based practices and experienced in managing a wide variety of complex breastfeeding situations. They advise mothers during pregnancy, help them establish breastfeeding, and provide assistance with any challenges that may occur. IBCLCs also train other health workers and educators so that they may support breastfeeding. IBCLCs undertake research, develop health materials, and implement programs and campaigns. As allied health care professionals with the only internationally-recognised credential for professional lactation services, IBCLCs work in hospitals, clinics, private practice, community settings, health promotion programmes, education and in research. There are currently more than 26,000 IBCLC certificants in 94 countries worldwide. The IBCLC is certified by the International Board of Lactation Consultant Examiners® (IBLCE®), which is accredited by the U.S. National Commission for Certifying Agencies. Pregnant women, parents and health workers can find an IBCLC who is working in Private Practice in Ireland here.